A few years ago we moved out of state and away from 90% of our family and friends. Since the move it seems like each passing birthday or holiday is getting harder and harder to deal with and not for the reason you might think. So what is making it so hard? The simple act of gift giving. Well thanks to a little site called Gift Accept things are starting to look up. Gift Accept is a safe, secure way to send gifts without having to keep track of contact information. No address? No problem. They make it simple to send candy, flowers and special gifts and even help you remember birthdays and special dates. What is truly unique about their service is that Gift Accept can sync with your Facebook account, making it easy to send a gift even when you don't know someones actually address. I had this problem not too long ago. A friend had a loss in the family and I really wanted to send a gift to express my condolences but felt awkward having to ask them for an updated address. With Gift Accept I can order my selection of flowers, candy, gifts, gourmet food, etc using just a name through my Facebook friends list ( or via email address) and Gift Accept will take care of all the details for me - like collecting a shipping address. If you choose to use the Gift Accept Facebook app you can also create a wish list/registry with items you like or desire, making it easier for someone like myself who never knows just what to get, to purchase something you'll truly love. Learn more by visiting Gift Accept online and checking them out on Facebook. 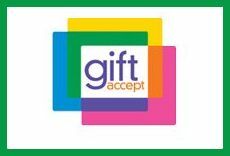 Win It: One lucky reader will win a $35 credit to Gift Accept! What a clever idea! I need to send long distance gifts, Gift Accept, meets that need.